We’ve all heard it. People are worried about pollinators and want to do what they can to help. Some are planting pollinator gardens, taking up beekeeping, or choosing organic foods to try to help save the bees. At the same time, many plant growers are recognizing that using pesticides can be risky for pollinators as well as beneficial insects. Many growers are increasingly using biocontrols to manage plant diseases and damaging insects. Biocontrols come with the advantage that they don’t induce resistance, they are less likely to result in secondary pest outbreaks, and they can be more effective than traditional insecticides. In addition, some retailers have made pledges to avoid plants grown with neonicotinoids, which have been implicated in bee health issues. How do growers connect these practices with customers concerned about pollinators? Few ornamental plants are sold with information conveying production practices. Organic is rare in the ornamental plant industry, so how do producers convey — and monetize — their environmentally responsible practices? 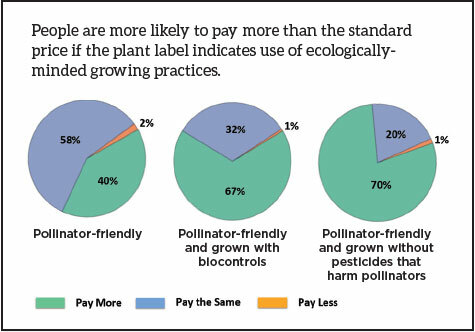 When it comes to selling plants, could an “eco-label” that signals pollinator benefits or environmental responsibility increase the price consumers are willing to pay? Can nurseries using biocontrol as a pest control method expect higher prices for their plants? What eco-labels result in the most market value increase, if any? Until now, little current research was available to flesh out the answers to these questions. So, during the spring of 2018, Woodburn Nursery & Azaleas Inc., Oregon State University Extension and the Northwest Center for Alternatives to Pesticides set out to test these questions. We surveyed 162 customers face-to-face in Oregon retail settings. Customers were surveyed at four retail nurseries in western Oregon (Fred Meyer in Milwaukie, Fessler Nursery in Woodburn, Cornell Farm in Portland, and Down to Earth in Eugene). Surveys were also completed at the Ag Fest in Salem, where Oregon Association of Nurseries attracts attendees with free plants. Using lavender plants in 4-inch pots, we tested three different “eco-labels” and asked customers willing to participate what they’d pay for each eco-labeled plant compared to a lavender plant with a standard label sold for $5. Given that the control was valued at $5 per plant, this translates to a 40–46 percent increase over the base price. 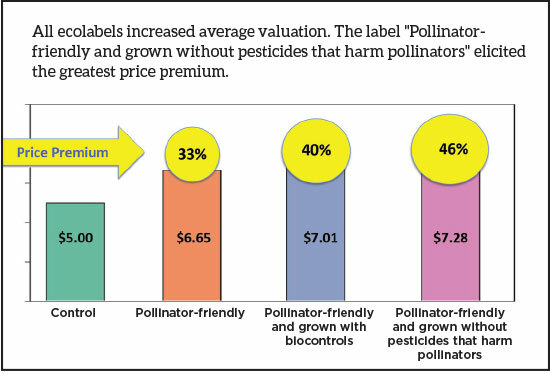 These production practices, perhaps perceived as environmentally-friendly, were more highly valued than the label “pollinator-friendly” alone, for which consumers were willing to pay $6.65, on average. The differences in valuation were statistically significant. 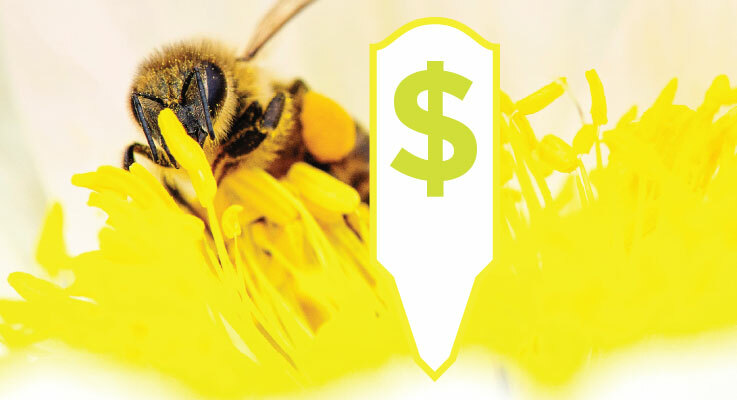 We found that the term “grown with biocontrols” was less effective, on average in eliciting a price premium than the phrase “grown without pesticides that harm pollinators.” Video taken concurrently with the survey reveals that many customers were unfamiliar with the term “biocontrol.” Attempting to gain a price premium by promoting use of biocontrol practices may require additional public education. The 162 surveyed individuals represented a wide cross-section of income and educational demographics. Statistically, neither survey location or customer household income affected valuation. Female customers comprised 63 percent of the respondents. Valuation was also not correlated with gender. To see real-live customer responses to the eco-labels captured on video, visit www.pesticide.org/ecolabels. Lloyd Nackley is a plant researcher, plant physiological ecologist and professor of horticulture at Oregon State University, stationed at the North Willamette Research and Extension Center in Aurora, Oregon. He can be reached at nackleyl@oregonstate.edu. Bruce Colman is a senior grower at Woodburn Nursery and Azaleas in Woodburn, Oregon. He can be reached at brucec@woodburnnursery.com. Sharon Selvaggio is the water and wildlife program director for the Northwest Center for Alternatives to Pesticides in Portland, Oregon. She can be reached at sselvaggio@pesticide.org.